My name is Susan, and I am an online drawing application-aholic! Today I found a new one, Slimber, via MakeUseOf.com, and it is very cute. I think your kids will love it. What a shame I can't draw to save my life! 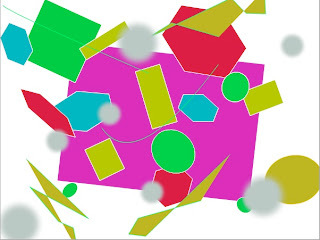 Once you go to the Slimber site, click Painter, then choose the dimensions of your art work. There are several tools and a colour palette to explore, and you can adjust brush sizes and shapes. My method was to play with each tool and colour to make a shapes picture which I oh-so-hopefully called abstract art. Once you've made your "art work", you can save it, or watch it again as a movie via the play button in the left bottom corner. It's fascinating to watch the movie of the development of a beautiful and complicated piece like the Golden Sun Over Hawaii. Once saved, your work appears in the gallery, and there you can click on it, and get its url, or the html to embed it. I like that there is no join up, so this is an ideal drawing editor if your kids need to make a quick digital picture of something, or to encourage their creative side under your supervision. It would be even better if it were easy to add clear text to a drawing, but you need to use the pencil for that. Writing with a mouse has never been this chook's strong suit! If you're looking for other online art editors, you can link via my article on another drawing tool, Flockdraw. After reading your posts I have started adding pictures to my sites. Wow what a difference they make. Your site is so amazing I love exploring it. When you get a chance stop by http://libearycorner.blogspot.com I have an award for you. I love what pictures can do for a blog or website too Ruth. In some posts, the picture I use is to give readers an idea of the application or site or book. In others, it is to contribute to the words, make a point visually. Even though I don't "do" awards, I love to get them because they tell me that my blog is useful and appreciated by others. Thank you!